Being out of routine in new environments is a good chance to reflect on where we are at. Isla actually loves going away. I think because we have always taken trips away from when Isla was born. 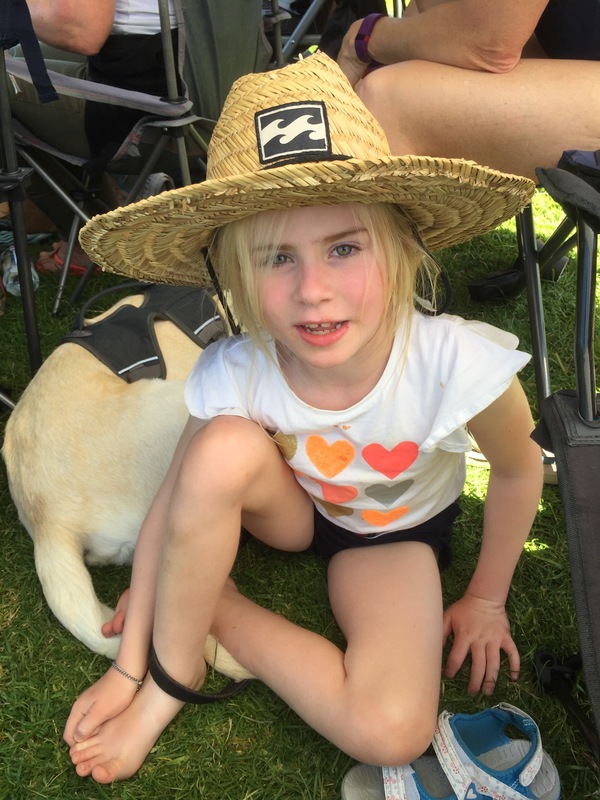 In fact her first holiday was when she was a couple of weeks old ! Also there are certain things that we have learnt that have made the transition easier. I liken it to having a baby or a toddler. You know you are going to have to take their favourite cuddly, their favourite toys and things that help keep them entertained along the way. Also you would pack their wipes, nappies, milk bottles, snacks, favourite drink bottle as essential items. We are still at this stage with Isla even with her being nearly 8. Also like a toddler who may have a tantrum if they get their breakfast served in the wrong bowl type of scenario, you choose your battles. Knowing Isla like we do it is pretty easy as long as we keep things as she expects. Certain items in the lunchbox (or the 2 lunchboxes she has), a favourite drink bottle with it filled to the top with water, her blanket, pillow, a soft toy and iPad. Add a few cartons of hot chips with sauce, a chocolate trumpet and a visit to a playground or two along the way and we are set! This time we also had another member of our family to think about and all of his requirements. There were a few standout moments for me on this short break away of how far Isla has come but also the struggles we will all continue to face with her being a small child in a much bigger body. It is interesting now with Bo in tow how we are perceived. Walking into a restaurant in Hamilton we were met with kind looks and smiles. 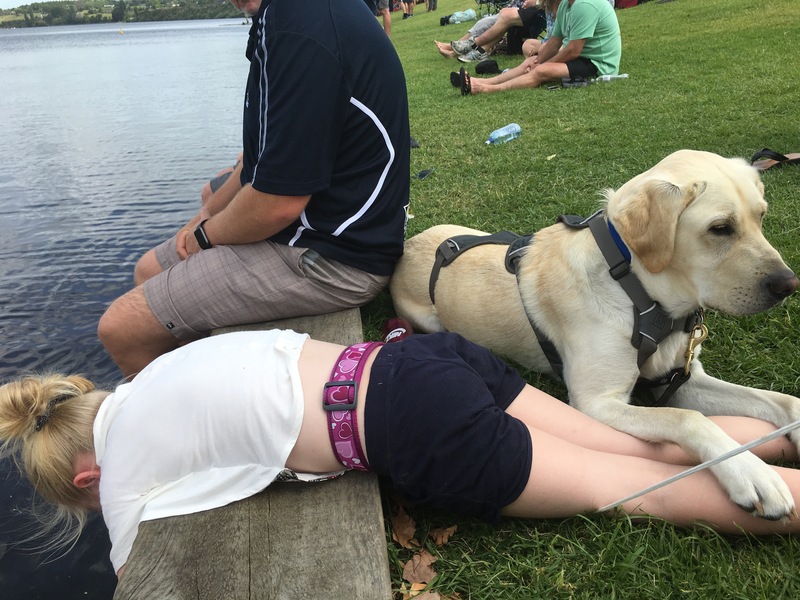 WIth Waikato being the home of Assistance Dogs there seemed to be a lot more awarenes however we have had the same response everywhere we have been in Auckland as well. Having Bo there with Isla makes us feel like we don’t have to explain ourselves. A scream from Isla in a busy restaurant turned heads, people saw Bo and their faces soften. A request for 3 different types of water. “Sorry no ice”, “sorry a shorter glass”, “sorry a shorter straw” doesn’t seem to be so hard to ask for with Bo by Isla’s side. Isla lying all over the seats with feet everywhere when we are out having a meal as she tries to cope with the people and noise doesn’t make us look like bad parents who can’t get our child to sit up nicely at the table. Being away and out in public a lot of the time meant Bo was working a lot more. When Bo is off duty he is quite a different dog. He is very social and playful. The transformation when he is working with his jacket on is quite amazing. Although it doesn’t look like he’s doing much lying there by Isla, it is hard work for him I’m sure not to go and see everyone and take them his toys. He was pretty perfect the whole time. He toileted on cue, was calm and tolerant and a good friend to Isla. It was so nice to have her tethered to him at the water’s edge at the lake which allowed me to relax a lot more than previous years. 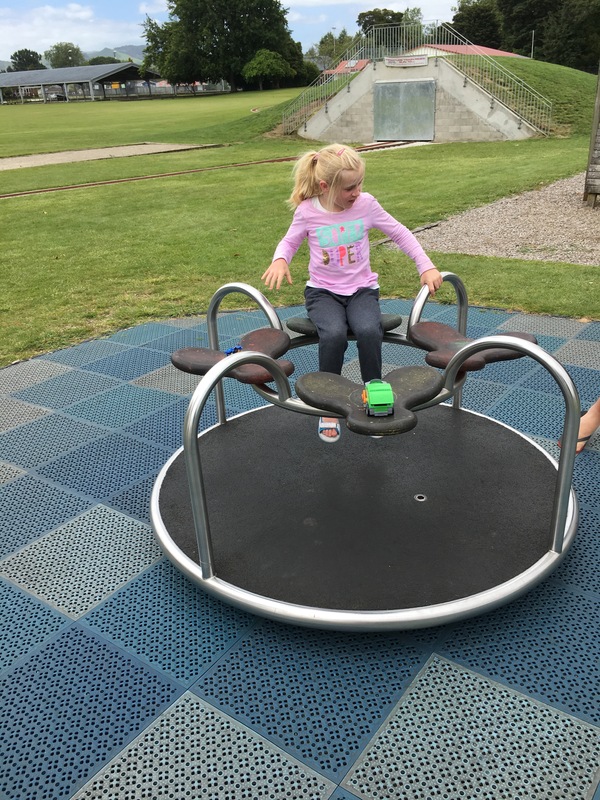 Playgrounds have always been a favourite activity for Isla. However I have discovered I am finding it particularly hard now Isla is getting older. She doesn’t have the social skills to play with the kids her age. I just want to go and whisk her away. Children sometimes can’t see what an adult might and empathise. I see kids joining Isla and then realise she is a bit different and then leave or I see that look they give her when isla will start stimming or will let out a big burp and they don’t really know how to handle it. It breaks my heart especially as she is becoming a little aware of others and trying to fit in. She really wants to play but she cannot pick up what’s appropriate and I really cringe watching her to be totally honest. I want the children to see and accept her for who she is but a lot of them really don’t know how and to be honest aren’t all that interested understandably and I don’t know how to bridge that gap especially on a chance forced encounter in a playground. As we have immersed ourselves in the special needs world the contrast catches me off guard every time. Luckily for her however she is just frustrated that others won’t do what she wishes and rejection isn’t really a concept she would understand at this time. She is also more than happy to take her paw patrol toys along and play with them in an empty playground. We are now looking forward to our Christmas break with all of our family together! Thank you to everybody who reads my blogs as I try and educate about autism and make the world a more understanding place for Isla. It’s been a great year and our girls are growing up and we are proud of all of them. Merry Christmas to all your family. Your blog moves me so much, I wish I could articulate even half as well as you do Sara.